Given that the history of art is tied inextricably to the history of christianity, most major museums in the western world have art with significant Christian influence. This resource, however, is focusing on museums that connect specifically and intentionally with the Judeo-Christian tradition. Biblical Museum– Amsterdam, The Netherlands. Where Bible, art, and culture meet in a monument full of history. A fascinating expedition through the world of one the oldest and most-read books. Archaeological discoveries, artifacts from ancient Egypt, centuries-old models of the temple of Solomon and Herod, religious objects from the Judeo-Christian tradition and even aromas bring Bible stories to life for visitors to the Biblical Museum. It houses a famous 19th-century model of the Tabernacle: a wonderful reconstruction of the sacred shrine housing the Ark of the Covenant, which the Israelites carried with them during their exile in the desert under the leadership of Moses. Displays centered on a model of the Temple Mount in Jerusalem explain the significance of this sacred place in Judaism, Christianity, and Islam. Clay tablets, fragments of papyrus and archaeological remains tell the fascinating story of how the Bible came into existence, and the influence it has had on Dutch society through the ages. Byzantine & Christian Museum– Athens, Greece. The Byzantine and Christian Museum is one of Greece’s national museums. 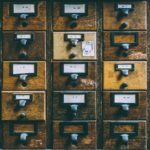 Its areas of competency are centered on – but not limited to – religious artifacts of the Early Christian, Byzantine, Medieval, post-Byzantine and later periods which it exhibits, but also acquires, receives, preserves, conserves, records, documents, researches, studies, publishes and raises awareness of. Christian Museum– Esztergom, Hungary. The Christian Museum is the largest ecclesiastical collection in Hungary, conserving European and Hungarian works of art of several centuries. On account of its Hungarian, Italian, Netherlandish, German and Austrian paintings, it is the third most significant picture gallery in Hungary, closely following the Museum of Fine Arts and the Hungarian National Gallery in Budapest. The Christian Museum is known also for the versatility of its collections. Besides the late medieval works of art – including the Calvary Altarpiece by Thomas of Coloswar, the Lord’s Coffin from Garamszentbenedek, and the Passion scenes by Master MS –, also the baroque and modern collections, the exceptionally rich collection of the decorative arts, and the collection of prints and drawings, which numbers over 5 000 sheets, are significant. Jewish Historical Museum– Amsterdam, The Netherlands. A modern museum of Jewish heritage housed in four monumental synagogues near Waterlooplein. In permanent and temporary exhibitions and events, the history and culture of the Jewish people in the Netherlands are presented. The Jubilee Museum– The Jubilee Museum was established in 1998 by Fr. Kevin F. Lutz. Its purpose is to preserve the Catholic mind and memory as it is represented in art. The museum embraces liturgical art and secondarily any art that in some way tells the story directly or indirectly of Christ, Mary, the saints, and the history of the Catholic Church. Museum of Biblical Art– Dallas, Texas. Since its founding in 1966 by Mattie Caruth Byrd, The Museum of Biblical Art Dallas has greeted over 50,000 visitors annually as a beautiful space where Biblically-themed art is exhibited. Re-built and re-opened in 2010 after a fire in 2005, the Museum continues to uphold its legacy as a distinguished institution in the arts and education community of Dallas-Fort Worth. 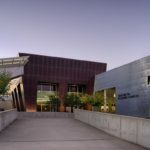 The beautifully remodeled Museum boasts eleven galleries, The National Center for Jewish Art, an on-site Art Conservation Lab, Via Dolorosa Sculpture Garden, and other major pilgrimage attractions. The Museum offers myriad programs, field trips, and events for art appreciators of all ages, backgrounds, and beliefs. St Mungo Museum of Religious Life and Art– Glasgow, Scottland. The award-winning St Mungo Museum, named after Glasgow’s patron saint, is home to inspiring displays of artifacts and stunning works of art exploring the importance of religion in peoples’ lives across the world and across time. Museum of Contemporary Religious Art (MOCRA)– Saint Louis University’s Museum of Contemporary Religious Art (MOCRA) is the world’s first interfaith museum of contemporary art that engages religious and spiritual themes. MOCRA is dedicated to the ongoing dialogue between contemporary artists and the world’s faith traditions, and to serving as a forum for interfaith understanding. In a time when religion is viewed by many in exclusive ways, MOCRA intends to be inclusive and embracing, a center for healing and reconciliation. The Museum of the Russian Icon– Moscow, Russia. At present, the Museum of Russian Icons – one of the largest private collections, numbering more than 4000 items. Vatican Museums– Vatican City is the home to several museums owned and opperated by the Vatican. Upper Room Art Gallery– The Upper Room Art Gallery is a non-profit global collective of artists & designers whose artwork specializes in organic and recycled materials and who are concerned with global poverty, social justice & environmental issues. Center Art Gallery– In addition to work by Calvin College students, faculty and alumni, the Center Art Gallery features exhibits by secular and religious artists of note. A variety of exhibitions are created and selected each year to educate and foster dialogue. Dadian Gallery– The Arthur and Marjory Dadian Gallery was dedicated in 1989. This museum-quality gallery is a jewel-box setting for at least five exhibitions each year, showcasing the works of artists who explore the intersection of faith and art. Davison Art Gallery– Supported by the Division of Visual Arts since 1996, the Davison Gallery operates as an integral resource within the Division’s academic program, and as a cultural center for students and the greater Rochester community. Doug Adams Gallery– Located at The Center for Art, Religion, and Education Berkeley, CA. CARE’s Doug Adams Gallery presents exhibitions that examine themes of religion and spirituality, broadly defined. Three exhibitions each year and related public programming offer opportunities for learning, reflection, and enjoyment for GTU students, faculty, and staff, and for the wider community. The Earl & Virginia Green Art Gallery– The Earl & Virginia Green Art Gallery presents a program of rotating contemporary art exhibitions on the campus of Biola University — see campus map. Located in the greater Los Angeles area on Biola’s campus, the Green Art Gallery is well positioned to represent a vital Christian worldview within the critical dialogue of contemporary visual art and to produce engaging exhibitions that grapple with issues concerning the intersection of faith with art and culture. The Green Art Gallery also provides professional development opportunities for Biola art students through gallery exhibitions and internships. The Eredman Art Gallery– Princeton Theological Seminary. The Erdman Art Gallery presents local and national artists for the benefit of the community. The gallery is located on the seminary campus in the Erdman Center. Exhibits are free and open to the public. Lookout Gallery– Located at Regent College B.C., Canada. The Lookout Gallery is a place where people are invited to make meaningful connections between art, theology, and the human condition. Mennonite Heritage Centre Gallery– The Mennonite Heritage Centre Gallery works side by side with the Mennonite Heritage Centre Archives to link history with the present and future. We wish to link the ethnic past to the multiethnic now and tomorrow through shared faith and ideals. The MHC Gallery joins Mennonite History with art in order to stimulate and keep alive Anabaptist/Mennonite distinctives built on faith, perseverance, and obedience. Osilas Galley– Concordia College, New York. Osilas integrates the visual arts into the cultural and educational life of the campus and community by providing quality exhibitions and programs that are diverse in style, content, and media; memorable, thought-provoking, and spiritually enriching; and of artistic originality, integrity, and excellence. 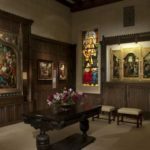 The Temple Gallery– Richard Temple Founded the Temple Gallery in 1959 as a center for the study, restoration, and exhibition of ancient icons and sacred art. 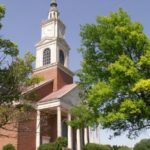 The Bowden Collection– Bowden Collections offers a variety of traveling exhibitions available for rental to museums, churches, colleges, seminaries and similar institutions. Seed Fine Art– Seeds Fine Art Exhibits’ mission is to serve our neighbors by transforming galleries into sacred spaces. They do this by unearthing the finest unsung contemporary artists of our time and compellingly presenting a visual narrative that addresses core issues concerning all humanity. Their exhibits always have a central theme which invites contemplation of “that something other” than the purely physical world, beyond science and intellect. Mysterious, awe-inspiring and beautiful, it points us to humanities ultimate meaning.